For the year ended March 31, 2016, the Jewish Community Foundation of Montreal’s pooled fund had a return of -3.2 percent. The average annualized return for the last five years has been 5 percent. 2016 was a turbulent year with fears of an economic slowdown in China, questions about the viability of the European Union as Greece negotiated another bailout plan, and oil prices that plummeted 19.5 percent over the fiscal year. Despite strong monetary and fiscal stimulus, equities dropped 4.3 percent globally and 6.6 percent in Canada. The JCF equity portfolio returned -0.2 percent versus the MSCI AC World Index return of -4.3 percent. 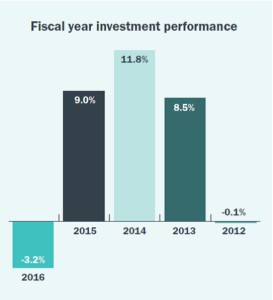 Most of the out performance came from JCF’s private capital managers who returned 9.5 percent for the fiscal year. Despite volatile equity markets, strategic acquisitions and positive secondary acquisitions helped our private equity portfolio perform well. Loose monetary policy in much of the world has led to continued low interest rates, and in some instances negative interest rates. With that environment as a backdrop, JCF’s Canadian Fixed Income portfolio gained 0.7 percent, in line with the benchmark of 0.8 percent. Hedge funds, down 0.9 percent, were able to provide shelter from equity market declines and volatility. Sector rotations and investment themes switching from risk on to risk off made it a difficult environment for stock pickers, but market neutral strategies did relatively well. JCF’s Diversifying Strategies portfolio outperformed its benchmark, the HFRI FoF Composite index, by over 475 basis points. The Fund uses a dynamic currency hedging policy approved by the Investment Committee with the aim of reducing the foreign currency risk and removing most of the short-term currency volatility and the resulting impact on spending. However, a portion of the USD investments are not hedged in order to provide another source of diversification to the portfolio. This past year the Canadian dollar depreciated 2% against the US greenback. 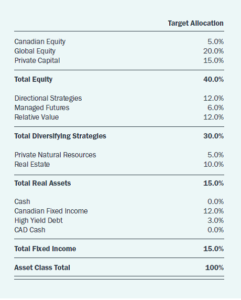 In an environment where the Canadian dollar depreciates, currency hedges cost the portfolio. JCF’s currency hedging policy resulted in the portfolio being fifteen percent unhedged over the year, which mitigated the hedging costs a bit. The unhedged return would have been -1.8 percent while the actual portfolio return was -3.2 percent.